Located in Nepal 's northwestern Himalayas is a land of intense and diverse vistas, a spectrum of flora and fauna, and a variety of ethnic groups. From the lush coniferous forests in the south to the desert wildflowers scattered across Mustang's northernmost plains, this area is unique. Caught in the rain shadow of Dhaulagiri Himal (8167m.) to the west and the Annapurna massif to the east, most of Mustang's 750 square-miles are trans-Himalayan desert. This boot-like piece of land juts north into the Tibetan plateau. At an elevation of fifteen thousand feet, the Mustang landscape reveals spires of ochre Earth and dramatic rock formations, as well as sandy flats and grassy plains surrounded by rolling hills-the hallmark of the Central Asian plateau. Tiji festival generally falls on monsoon season. It is celebrated in the kingdom of Mustang . It is also known as the Mustang Tiji festival and is celebrated for three days. This festival also holds the myth which reveals that demons get chased away if you celebrate this festival. You can observe this festival while trekking through upper Mustang hidden valley trek and it is one of the legendary destinations for most trekkers. Therefore, trek to Mustang during this season is an ample opportunity to experience this unique festival. Mustang gate is located between two villages Chuksang and Tsele. There is a narrow passage created out of rock fallen from the cliff and the entire flow of Kaligandaki squeezes through it. You can pass through the gate during winter and follow the river northwards but it is impossible to go through this route during summer. You can see a longest Mani wall of Nepal just outside the Ghemi village. This 300m long wall is inscribed with prayers and painted with stripes of charcoal and ivory, cadmium and burnt umber earth. This monument is regarded as the intestines of local demons which were dejected by guru Rimpoche as he flew to Tibet from India . He conquered with all enemies of Buddhism. The stunning red cliff of Drakmar is said to be splattered with blood of demons. This five storey palace has a huge collection of religious statues and scroll paintings. It also has a large collection of historical and religious documents include complete collection of Buddha's teachings. Inside the walled city of Monthang in this land of Lo lie Champa, Thugchen, and Chodyi gompas. Champa lha-khang ("god house") houses an enormous statue of Maitreya, the future Buddha. The walls are painted with elaborate mandalas with two meters in diameter. Thugchen gompa's expansive altar room is reminiscent in size and scope to some of the largest temples is Tibet, hinting at the historical importance Lo Monthang has played in the perpetuation of Tibetan religious culture. Chodyi gompa is the home of Tashi Tenzin Rimpoche, the Khenpo, and the monastic spiritual authority of Lo. Chodyi's compound also includes a newly-established school for young monks. It is Located east of Monthang above the villages of Yara and Gara.The gompa at Luri has been described as a "jewel" by travel writers. The central chamber of the gompa is carved out of rock, creating a domed ceiling on which are painted a series of Mahasiddhas, the Holy men of Buddhist myth. The wall paintings of Luri are exquisite examples of Newari craftsmanship and classical Indian-style renderings of religious figures. Luri also includes a large chorten, marking it as one of the most sacred sites in Mustang. Half a dozen of these reliquaries are said to exist in Mustang, though only a few of their locations are known. Dhaulagiri 1- 8163m, Sita Chuchura 6611m, Nilgiri 6940m, Thapa Peak 6015m, Tukche Peak 6920m, Tilicho peak 7134m, Thorong Peak 6484m, Yakawa Kan 6482m, 7035m, Brikuti 6364m, Chuungian Chanma Himal 6165m. 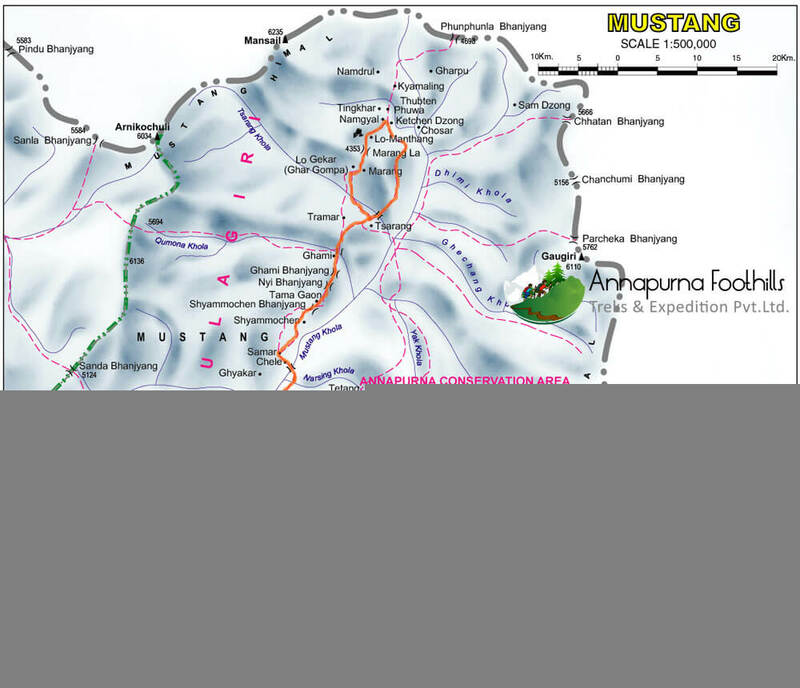 Mustang Himal 66234m. Arniko Chuli 6034m. And more snow capped mountains. Culture: Majority of Thakali, Tibetan, Gurung, Magar, Chhetri. Accommodation: 4 Nights in Kathmandu, 1 Night in Pokhara, 11 Nights in trekking lodge/ camping. In the morning we’ll take a flight to Pokhara, a nice little tourist town with some wonderful restaurants and mountain scenery. It is known as a place of leisure and trading, as well as a starting point for many different treks. Time permitting we'll visit the Tibetan Refugee center. In the late afternoon there will be free time to explore around the lake area. Early morning we’ll catch a breathtaking 35 minute flight to Jomsom. The flight takes us up through the Kali Gandaki gorge, the world’s largest, with its towering snow-capped peaks of Dhaulagiri and Annapurna . It will seem as though we can reach out and touch the peaks! Below us will be magnificent views of waterfalls, canyons, and terraced fields. This is truly one of the world's most spectacular flights! Upon arrival in Jomsom, we’ll meet the rest of our trekking staff for lunch. The rest of the day is free to relax or explore the village Trekking Day 01:Today we start our trek by doing a fairly easy section of the trail along the Kali Gandaki River to Kagbeni, the gateway to the restricted zone of Mustang and one of the major trading routes between Tibet and India . The traders brought salt from Tibet and barley, spices and clothes from India . After the Chinese invasion of Tibet , trade came to a halt and many of the rich villages lost their revenue and later, many of their people. Nowadays, though there is again some trade, the majority of village income comes from tourism. As we enter the dusty village, legend says that we should think good thoughts, leaving all bad ones outside the town gates. From Kagbeni to Tangbe, the trail winds along the east riverbank and occasionally ventures out into the rocky river bed. Initially, the trail climbs steeply to the top of the hill but we'll be rewarded with a spectacular view of prayer flags, stupas, and villages. After crossing several windblown plains and passing through a canyon, we arrive at the Mustang village of Tanbe . This small village is filled with whitewashed adobe houses nestled against each other and is surrounded by beautifully terraced fields of wheat, barley, and buckwheat, as well as small apple orchards. On the lower side of Tangbe, we'll see three elegant chortens and the remnants of an old abandoned fort. As we continue our walk, be on the lookout for black ammonites, small fossils of coiled sea mollusks that inhabited the Tethys Sea and covered the Tibetan plateau millions of years before the Himalayas were formed. They are considered to be holy by many local people. Continue on to Chele, where we overnight. The climb from Chele is up a fairly steep spur to a cairn at 10,329 feet, from which there is a view of the village of Gyagar across the canyon.The trail, which is literally carved into the side of this spectacular canyon, continually offers spectacular views. After crossing a mountain pass, the trail makes a long gradual descent on a pleasant trail to Samer. Finally after passing through several small canyons that are home to cool streams and shady juniper trees, we arrivie in Geling at 11,880 feet. Though the largest village before entering Upper Mustang, is a rarely visited gem. The town, set among numerous poplar groves and a central stream, boasts one of the oldest Gompas in Mustang. Spend the evening relaxing in front of the central field, where you can observe grain being threshed, animals grazing, and children playing. From Geling, the trail climbs gently through fields of barley and groves of poplar trees up the center of the valley, passing below the settlement of Tama Gaun and an imposing chorten. After rejoining the direct trail, it becomes a steep slow climb across the head of the valley to the Nyi La pass at 13,035 feet, the highest point reached on the trek. Charang is a maze of fields, willow trees and houses separated by stone walls at the top of the large Charang Cho Canyon . The huge five story white dzong and red gompa are perched on the edge of the Kali Gandagi gorge on the east end of the valley. Overnight in Charang. Today we'll move slowly but steadly up a rocky trail to a cairn on a ridge opposite the village at 11,841 feet. The trail turns north and climbs gently to a large isolated chorten that marks the boundary between Charang and Lo. After a rest break we'll travel across a desert-like landscape painted in every hue of grey and yellow.. Finally, we reach our destination- the whitewashed walls of the city of Lo , which sits among fields filled with horses and yaks. We may even have time to see the start of the Tiji festival. We spend the better part of the day at the Tiji Festival watching all the dances and celebrations that take place, including horse racing and a giant tug-of-war. We’ll see Tibetan women in their traditional clothing and colorful jewelry, monks in their robes and dancers in elaborate costumes. 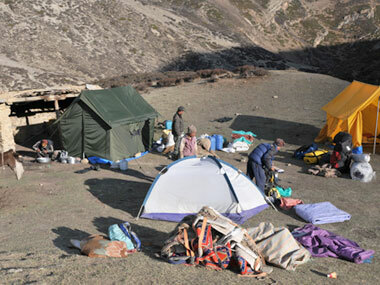 This is an almost unknown festival that most Nepal trekkers never experience. Definitely bring your cameras along today! In addition to the festival, there are many other activities in Lo Manthang from which you can choose. Spend today exploring the intimate alleyways and courtyards of the city, or you can rent a horse and visit some of the other villages in the area. Fly from Pokhara to Kathamndu or Drive from Pokhara to Kathmandu 1300m 6 hrs enad trekking program. We consider today an “Rest day” just in case the flight can’t land due to weather. Otherwise, we will go to see the ancient city of Bhaktaphur , once a separate kingdom. The city still retains an architectural and design spirit of a feudal state focused on artistic and religious glorification. You will feel you are walking back in time strolling through the core of the old city now preserved and interpreted as a UNESCO World Heritage Site. Take some time to look in the shops to observe potters, weavers, brass-makers, religious artisans, Brahmin priests and spice merchants carrying out their professions as they have done here for hundreds of years. We will end our journey with a farewell dinner this evening. The monsoon starts in July to August in Nepal. Nevertheless, there are few rain shadow areas such as Upper Mustang, Upper Manang, Rara Lake, Langtang valley, Everest Gokyo valley and Dolpo Region where we can go for trek even in monsoon. Due to the presence of huge mountains in this area, the rain cloud can’t go there and it remains unaffected by the monsoon. However, we suggest you to carry raincoat and insect repellents. The safety and security of clients is a matter of great importance for us. All of our trips are led by qualified professional government license holder guides and they have received adequate training from the government of Nepal. We always carry first aid kits in our trip. Out duty is to work hard for you safety and comfort, no matter where we go. Therefore, we work very honestly to provide you the Himalayan experience that suits your needs. Please feel free to put forward your queries for making your trip more significant and memorable. Lunch & Dinner) in Kathmandu keep $ 15 to 20 for per meal in Tourist restaurant. Any Alcoholic Drinks, Cold Drinks, Boiled & Mineral Water, Beverages, Etc in Trek. Wages Sherpa's, porters and sirdar. Costs of staff, equipment and food.